The new Peugeot 308 SW Estate is one of the most practical cars around right now. With a hugely spacious boot and a range of economical engines, it’s being snapped up by families who want a hassle-free experience on the road. Oh, and it’s also great to look at. Taking its cues from the smaller 308 Hatchback, this Estate variant is hard to beat in its sector if you want a useful estate that looks the part. It’s lighter than last time around, which means it doesn’t feel so cumbersome on twisting roads, while you won’t pay more than £30 in road tax. 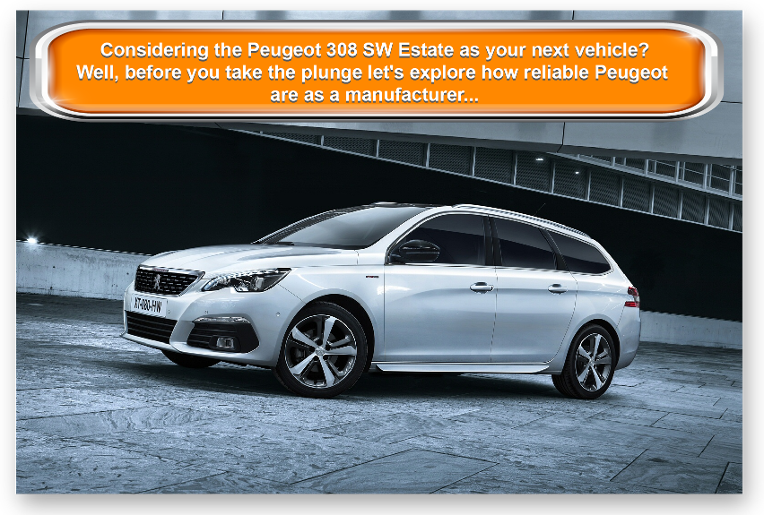 OSV takes a closer look at what it’s all about with our Peugeot 308 SW Estate review. There is plenty of engines to choose from – seven altogether, including a pair of petrol engines and five diesels. Not all of them come with ever trim level, but the variation of choice is still good. Body lean is noticeable in corners thanks to the soft suspension, but we expect most buyers will be able to deal with that, especially when the trade-off is lots of comfort, especially on the motorway. The steering doesn’t involve you in the driving experience as much as we’d like, while the manual transmissions are a bit of an issue. However, it’s rare that anyone buys a car such as this for the driving experience. Having said that, few people are going to turn their noses up at a car that drives well, and there are better cars to drive in this class than the 308 SW Estate. Our pick of the engines is a 1.2-litre e-THP which delivers up to 128bhp – quite astonishing when you consider how small the engine actually is. On the road, it’s both quiet and smooth and can even be entertaining. A 110bhp variant of the same engine is also available. It’s smaller and can only be paired up with a five-speed transmission. Under pressure, it will feel strained. The diesels are better suited to this car, with a 1.6-litre BlueHDi being our top recommendation. It’s powerful enough, as well as economical. However, despite being something of an eco-warrior, it’s also pleasingly refined and as quiet as the above-mentioned petrols. The range-topping GT model gets treated to the 2.0-litre BlueHDi diesel engine, which you can only get with a six-speed automatic gearbox. However, shift paddles mounted onto the steering wheel are offered, and you can use these to change gear manually. The GT is, as expected, a keen performer, and you can sharpen throttle response using the Sport mode button. This button also raises the volume of the engine. In terms of the numbers, the engine can get you from a standstill to 62mph in 8.6 seconds. The 308 is longer than last time, while the French brand have clearly spent a lot of time improving the interior. It’s comfortable, although the higher up the range you go the more comfort you will lose, thanks to larger alloys. The uncluttered dash represents a big improvement. A big 9.7” touchscreen that controls most of the 308 SW’s functions and controls dominates, and it’s reduced the need for all the buttons that made this car’s predecessor look untidy and confusing. However, the touchscreen is a bit slow to react at times, which can be frustrating. Moreover, the menu layout isn’t exactly simple, and you might find yourself taking longer to change the radio station than your dad took on his old Vauxhall Cavalier from the early nineties. We’re expecting a software update to come along and save the day, but we’re not holding our breath. There are more soft-touch plastics than before, although some cheaper plastics remain. So while overall cabin quality is much improved, it’s still not on par with some rivals, such as the VW Golf Estate. Peugeot clearly had families in mind while conceiving this car, as practicality is very good. Its 660-litre boot can even compete with rivals in the sector above! It’s also an easy-to-use boot, thanks to a low load lip and wide opening. 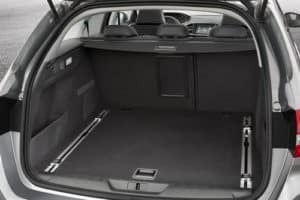 And if you fold down the rear seats, you can improve the space to 1,775 litres. However, there are minor criticisms of the cars overall usefulness. For example, there aren’t as many storage spaces as you’d expect from a large family Estate. The glovebox is way too small, and we can’t understand why the fuse box is found inside the glovebox on right-hand drive models. Worse still, legroom in the rear is poor. The Access model gets a decent amount of standard kit, including Bluetooth connectivity, a CD player and air conditioning. The Active trim adds a DAB digital radio, rear parking sensors and sat-nav, while Allure comes with electric folding mirrors, a reversing camera, and all-round parking sensors. GT models get treated to bigger alloys and unique GT styling kits. Our picks from the list of optional extras include a panoramic sunroof, Napa leather seats and the Driver Sport pack which is standard with the GT but can be added to the Allure model. Prices for the new car start out from almost £18,000 and rise to £27,400. If you want to lease the car, you can pick up a deal from as little as £200 + VAT per month. For more information on our leasing deals, you can check out our page here. The engine range is characterise by a series of economical power plants, which means that running costs are generally very good. Indeed, thanks especially improved aerodynamics and the BlueHDi engine, the 308 is one of the cheapest cars to run in this sector. Road tax is super impressive – the most you’ll pay is £30 a year, which you’ll pay out if you go for the 1.2-litre petrol engine, a power plant that can achieve average fuel economy returns of 67.3mpg. But it’s the 1.6-litre BlueHDi 120 diesel engine that grabs the headlines. It can return up to 88.3mpg and won’t cost a penny to tax. The car is fairly inexpensive to insure – as long as you avoid the GT model, which sits as high as group 28. It lacks a few clever touches that would have seen it get 5/5 for practicality, but visibility is good, leg and headroom is good, and the car is massive. Over 88mpg from the BlueHDi diesel will appeal to families. The 308 SW’s boot is the biggest in this sector. The chassis dynamics are not going to thrill you, and you might even get a little bit bored. Soft suspension also contributes to a lack of entertainment. The dash is attractive enough, but on the whole the interior lacks the quality lavished on rival cabins. Peugeot never represents a sound investment if you want a decent return on your money after three years. 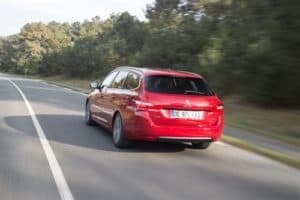 Let’s see how the car measures up against its rivals in the comparison section of our Peugeot 308 SW Estate review. 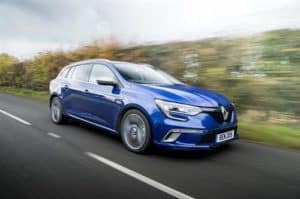 The new Renault Megane Sport Tourer Estate looks almost as good as the hatchback from which it’s derived and adds more versatility. For an Estate, the new Megane Sport Tourer is surprisingly quick in a straight line, but it lacks engagement. With that said, it doesn’t drive dissimilarly to the hatchback and shares the engine range – although these engines have to work a bit harder to pull along this bigger car. There is also no denying that the extra size affects drivability somewhat. The dCi 130 engine is set to be the most popular. It can do 0-62mph in 10.0 seconds, and offers plenty of punch. It’s good on the motorway, and lets you overtake with ease and confidence. A less powerful dCi 110 diesel takes 12.3 seconds to do the 0-62mph dash, while a more powerful 2.0-litre 163bhp diesel can do it quicker but is not yet available in the UK. A 1.2-litre TCe 130 petrol engine isn’t the most performative around, and takes a fairly tardy 10.6 seconds to get you from a standstill to 62mph. However, it’s well suited to everyday driving. If it’s out and outpace you want, a GT model stands at the top of the range. Running costs are good. This is a small estate so it was always expected that it wouldn’t cost too much more to run than its hatchback sibling, which is good news for families. The dCi 130 engine will be the best-seller, and with fuel economy returns of 70.6mpg, it’s easy to see why. The interior has been brought right up to date – it’s now stylish, well-built and modern. Fit and finish has never been its strength in the past, but it’s nice to see Renault putting some major effort into this aspect. The cabin is just as impressive as the hatchback’s, while ride quality is good. There are bigger boots in this sector and beyond, but the new Renault Megane Sport Tourer Estate is super versatile. Legroom is good upfront thanks to the clever design of the dash, while Renault claims that legroom in the rear is actually the best in the class. Storage spaces include cup holders built into the front centre armrest, as well as upholders in each door. The boot measures 384-litres, which is far from class leading, but it’s well designed and makes it easy to load your items. 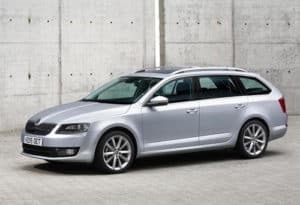 The new Skoda Octavia Estate is as practical as they come. It’s spacious, cheap to run and built to last. The Octavia Estate wasn’t designed to be fun to drive, but it is quiet and relaxing. The suspension is a bit firm, but the ride is comfortable. Four-wheel-drive is an optional extra, and well worth snapping up if you know you’ll be encountering some difficult terrain fairly frequently. The best performer in the range is the vRS Estate, which is essentially a VW Golf GTI. It can do 0-62mph in 6.9 seconds, before maxing out at 152mph. Barnstorming. If you don’t fancy shelling out the cash for the vRS, there is a 1.4-litre TSI petrol available, that can get you from rest to 62mph in 8.2 seconds, while a smaller 1.0-litre TSI petrol engine does it in 10.0 seconds. The diesel engines are cheaper to run, and can still offer some genuinely decent pace and performance. The 1.6-litre diesel, for example, can get you from a standstill to 62mph in 10.7 seconds, while returning fuel economy of 80.7mpg. A more spirited 2.0-litre 148bhp diesel, meanwhile, can haul you from rest to 62mph in 8.5 seconds, while averaging returns of 70.6mpg. The interior is well-built and offers plenty of space. If you go for the larger alloys, you’ll lose some comfort, but apart from that, the cabin is a pleasant place to be. The dashboard is easy to use, and Skoda have paid plenty of attention to detail in getting things right. Lots of soft-touch materials have been used to give it an upmarket feel, helping it to stand out from a lot of its rivals. Practicality is very good. The improved 610-litre boot will be more than enough for most buyers, even if it’s still 50-litres smaller than the one in the Peugeot. Five adults can sit in comfort throughout the car, although anyone sat in the middle rear seat will find that feet space is sparse. Small storage spaces are dotted around here and there, while you can fit a large bottle of water in the glovebox. The new 308 SW is a marked improvement on its predecessor. For a start, it’s much better looking, while space is another area it’s improved on massively. It’s hard to find fault with the engine range too, which is characterised by strong and economical units. One criticism would be that the punchy engines aren’t complimented by stellar handling, but most buyers don’t concern themselves with having a ball behind the wheel of an estate. On the whole, the new Peugeot 308 SW Estate has come a long way, and deserves a test drive at the very least.